Developed in Australia in 1870, the Australian Kelpie is an outstanding breed noted for their strong natural guarding and herding instincts. They are capable of working poultry, goats, sheep, cattle, and reindeer. They are the most popular breed in their native Australia and are revered in several other countries as well. This breed possesses keen senses and an alert expression. Australian Kelpie's are extremely agile and have an inexhaustible supply of energy. The Australian Kelpie is considered to be the best performing medium-sized sheepdog. Despite their size and their compact and muscular body, they are versatile, capable, and without limitation. The Australian Kelpie is a loyal companion. They are mild mannered at home and intense when at work. This breed is rarely affectionate and typically bonds to one person. They are highly devoted and friendly to their master. Australian Kelpie's do well with children they have been raised with and will herd other dogs, pets, and animals. The Australian Kelpie is not aggressive but will guard and protect his family and territory regardless of any risk to themselves. 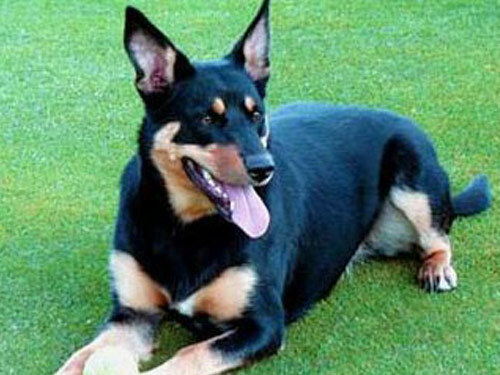 The Australian Kelpie is a double coat breed. The outer coat is straight, hard, and weather-resistant. The under coat is dense and short. This breed is an average shedder. The Australian Kelpie is independent and highly intelligent. Early socialization is recommended. They do not respond to harsh or heavy-handed methods. Training should be done with firmness, fairness, and consistency. Australian Kelpie's are not suited to apartment or city dwelling. They require a rural setting in an active environment. The Australian Kelpie thrives on an inordinate amount of exercise and a job to do. If they become bored they become destructive.